WORDPLAY. 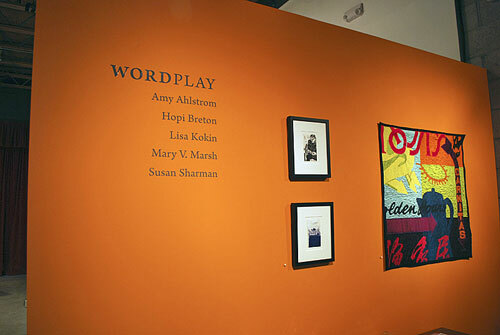 An exhibit that highlights five Bay Area artists who thoughtfully explore the power and possibilities of marks, type, and written language while appreciating them as visual subject. 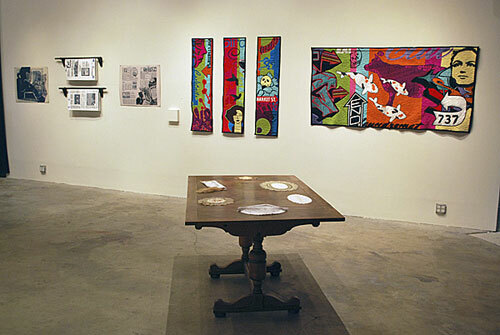 Working in highly diverse media, from printmaking to cast-iron sculpture to needle and thread, each artist – Amy Ahlstrom, Hopi Breton, Lisa Kokin, Mary V. Marsh, and Susan Sharman – creates a personal vocabulary rendered in various ways from straightforward graphic or illustrative interpretations to abstract iconography. 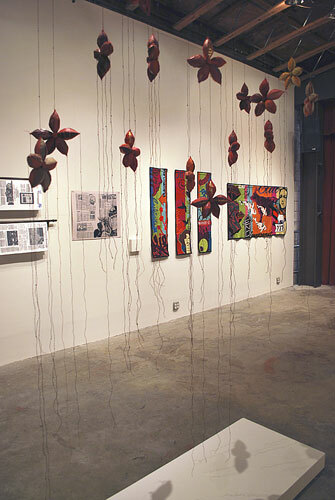 Amy Ahlstrom juxtaposes the traditional art form of quilt-making with collage-like motifs drawn from urban life. Her work suggests themes more commonly associated with pop art painters, layering contemporary imagery such as graffiti, signs, and buildings that predominate city views. Hopi Breton’s sculpture, cast in iron or bronze, or cut from stone, frequently morphs into abstract marks and symbols, suggesting cuneiform or other unspecified forms of writing. Her use of dense materials gives weight to her “invented” languages. 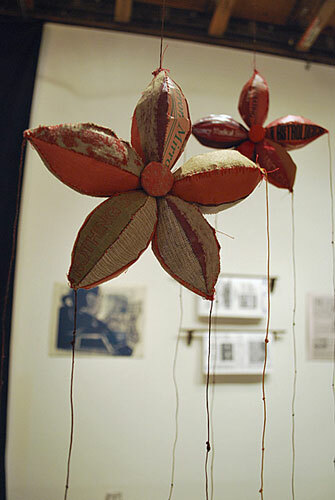 As sculpture, they occupy space, physically soliciting responses and emphasizing the emotional power of symbols. Lisa Kokin creates mixed media assemblages by deconstructing books and inventively sewing them back together. Her work makes particularly provocative use of spliced self-help books, which she accumulates and collects in abundance from local recycling centers. Mary V. Marsh’s finely executed prints reflect her daily life and scenes, with imagery that conveys the prevalence of words in her life. Books and newspapers are constant companions as well as subconscious motifs, reflecting the way words await the reader, filling the air and occupying our minds. Susan Sharman honors and elevates the traditional art of embroidery, augmenting found textiles with her exquisitely stitched typography. Through word choice, carefully shaped type, and the texture of her stitch work, Sharman explores the power of a word or phrase to evoke place, memory, or story. 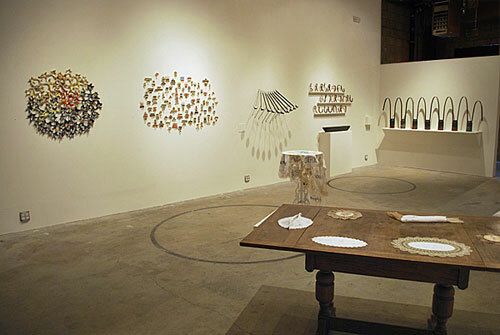 Drawn to the implied stories inherent in the antique, handcrafted doilies she juxtaposes these existing elements with her own additions.